Social media may not be the first resource educators use to promote college readiness skills among 12th grade students. But school and public librarians are testing the waters with Pinterest, Twitter, and LibGuides to get details on college prep—and even college life—in front of their seniors. 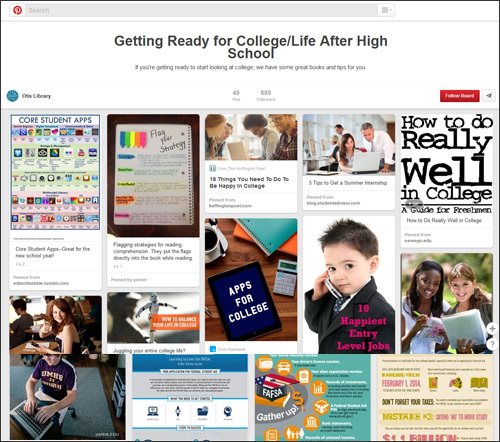 Boyd launched a Pinterest board on college readiness chockablock with posts on common financial aid mistakes students can make, how to prepare for moving into your dorm, and even a list of the 25 healthiest U.S. colleges. A visual learner herself, she liked the presentation on the social site, and found it easy to launch and install the link to the school library’s tool bar. Boyd said there was little writing required and that her work was more about identifying content that fit the scope of what she was trying to present. Pinterest placed in the top four social media sites favorited by teens, according to a recent Piper Jaffray survey—the only site besides Instagram to gain more eyeballs among this age group over a six month period in 2014. Today, college readiness is the responsibility of everyone a student connects with on a daily basis, not just college counselors or parents. All educators are looking for ways to keep students focused on the next steps for their education. With 63 percent of jobs requiring some level of higher education by 2018, college is a necessity. Supporting students so they get good grades and score well on the ACT or SAT is crucial. So too is helping them find ways to afford those years in school—or even the multiple application fees. That’s why school librarians are looking to reach seniors where they already are: often online, on social media or on sites they’re comfortable using. 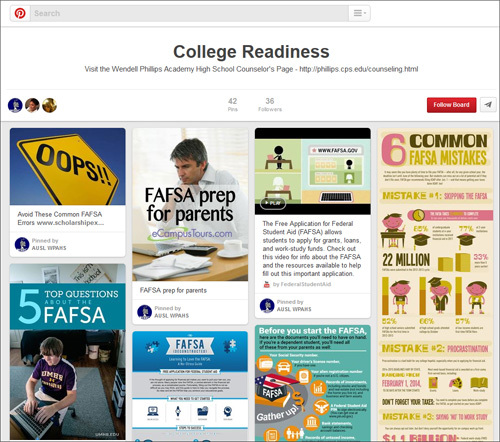 Other Pinterest boards to check out include “Getting Ready for College” from the Otis Library in Norwich, CT, and “College Readiness” from the Staley High School Library Media Center in Kansas City, MO. At Forest Park (IL) Public Library, Regina Townsend pulls her student patrons in to watch virtual tours of schools on Youniversitytv.com. The site provides detailed videos on colleges from UCLA to Princeton with details on tuition, the average SAT score, a school’s acceptance rate, and how to request more information. Like Boyd, Sherri Crawford is a big fan of Pinterest, and launched her board (pinterest.com/sherrilibrarian/college-readiness) about two years ago. But when Shawnee Mission North High School in Overland, KS, went 1:1 with digital devices, her district shut down access to Pinterest. Now Crawford utilizes a LibGuide produced by Kent State University Libraries and Twitter (@TheNorthLibrary), tweeting about ACT deadlines, financial aid, and library-related details such as research skills colleges expect freshmen students to know. A challenge is knowing if students are actually using digital sites to glean details the librarians want them to have. Crawford can monitor log-ins on LibGuide. But it’s hard to discern if a post has attracted eyeballs unless someone favorites a tweet or repins a board on Pinterest. Reaching students is never a simple equation where one plus one equals two. As any good teacher knows—parents as well—engagement is 90 percent of the battle. The goal is to see what sparks a student—and slip details through that particular doorway. SLJ contributing editor Lauren Barack writes about the connection between media and education, business, and technology. A recipient of the Loeb Award for online journalism, she can be found at www.laurenbarack.com.